My grandmother’s wild herb books. She was a believer in herbal remedies and modern medicine. For a long while I’ve been thinking about social media and how it is changing American culture. Some of the best behavior can be found on social media, but the negatives definitely seem to be outweighing the good, in the larger cultural context. This blog post isn’t really just about needleworking, so, please stick with me as I give some back story. “Whenever I learn a new type of needlework, I try to learn the basics first and practice a lot. My mother taught me simple rules about embroidery and I still follow them. These rules are in the instructions in almost every cross-stitch kit and book too. They aren’t my mother’s rules, but the time-tested standards for embroidery, of which cross-stitch is a popular type of embroidery. Anywhere in social media, I run into issues stating facts or an opinion that offends someone or evokes anger, so it was no surprise to me that on floss tube, I would offend someone. The prevailing attitude is it’s taboo to say anything is wrong, apparently, even when what people are promoting is not only wrong, it’s a recipe for disaster for new stitchers. Some stitchers started a facebook group called “Stitch Maynia”, which began as some event in May, where they focus on starting a new cross-stitch project every day in May. Their focus is all about starting new projects, not about finishing what they start. They believe they are promoting cross-stitching and doing something good. There’s now also a common attitude among many stitchers that it doesn’t matter how the back of their work looks, it’s all about that stitching makes them happy. If you don’t care that your work is sloppy and a messy back on needlework is sloppiness (that’s a FACT), fine, but once you have a facebook group and a floss tube channel, with thousands of followers, well, you can become a corrupting influence very quickly. This happens with Reality TV stars constantly too. 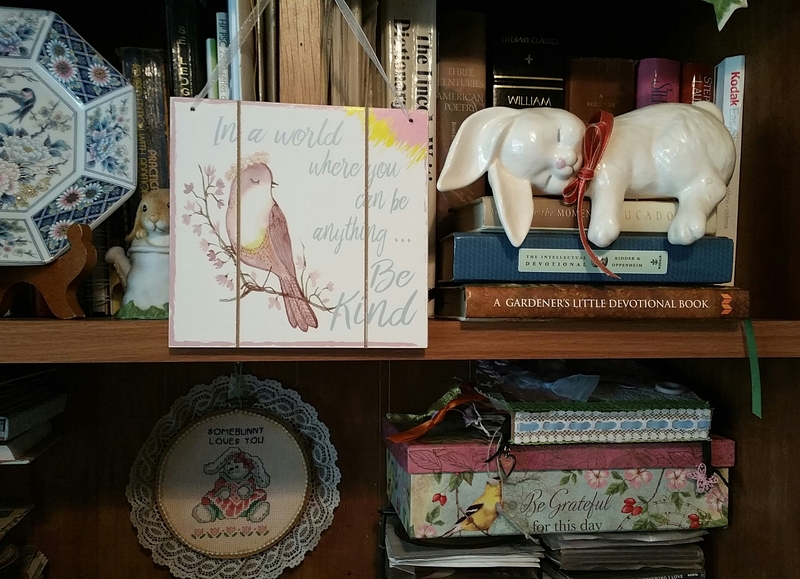 I tried to point out to a fairly new cross-stitcher that from years of experience with needlework and crafting, that starting too many projects leads to lots of unfinished projects and also added stress. To keep track of this madness, there are floss tubers waxing on about all their “WIPs” (works-in- progress) and the spreadsheets, stitch journals and stitching schedules, they are using to keep track of it all. Into this chaos, they insist they love stitching and starting so many things makes them”happy”. For a new stitcher, this approach assures lots of wasted money, lots of unfinished projects and lots of poor needlework. There is no foundation, of focused practice and good stitching habits, upon which excellent stitching is built. The thing that irked me the most about many of these “popular” women in that community is I observed new stitchers starting YouTube channels and wasting a lot of money trying to keep up with the Stitch Maynia crowd – trying to start too many projects, not working to develop good stitching habits, not working to learn to get the basics down pat and not slowing down to focus on finishing projects. I have needlework patterns back to the late 70s and I started counted cross-stitch in the early 90s, so I’ve acquired a collection of counted cross stitch patterns that I will never be able to have the time to stitch in this lifetime. I also have tons of scrapbooking supplies, rubber stamping and numerous other craft and needlework supplies. I acquired a sizable fabric collection intending to some day learn to become a proficient quilter… except the few quilting projects I’ve done, I don’t enjoy at all. I don’t really like quilting, even though I love handmade quilts. 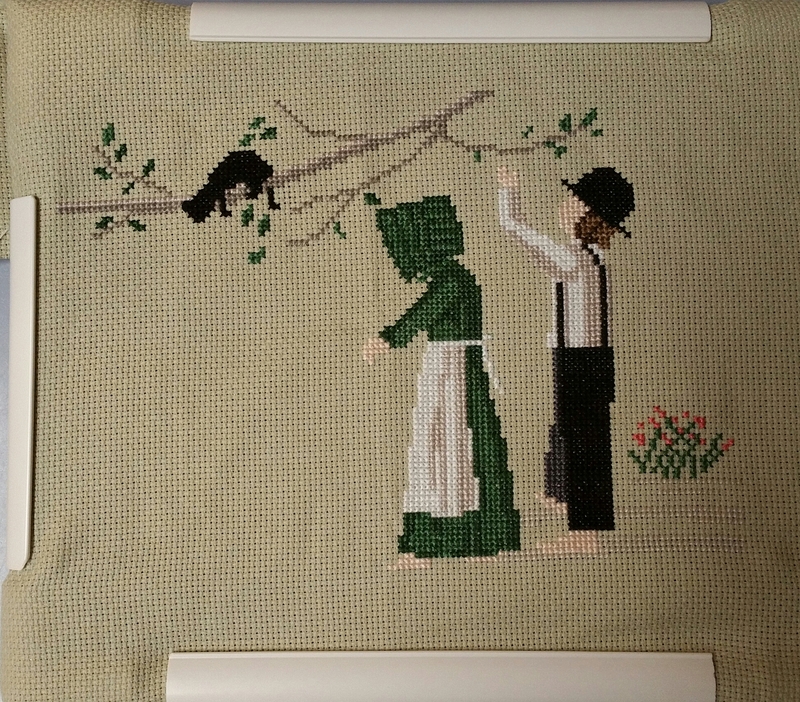 Simple Diane Graebner cross-stitch pattern in my q-snap frame, that I’m stitching right now and still need to add the apples, apple basket and goose. This particular pattern was in the March/April 1996 Cross-Stitch & Country Crafts magazine. Yes, I still pull out old patterns to stitch and that is why I am not getting rid of my large collection of cross-stitch patterns. On YouTube, I’ve watched a lot of other crafting videos and learned a lot, just like I learned a lot from many of the needleworkers’ videos too. However, each group of YouTubers seems to have the same dynamic of “influencers”, who become the most popular YouTubers in that community and then groupies (or subbies, since they are subscribers to the channel), who decide they want to be just like those popular “influencers”. These groups also have the same dynamic of popular “influencers” trying to use their YouTube channel as part of an online business, along with social media presence on facebook, instagram, setting up etsy shops to sell their products or starting a Patreon subscription site, where followers can subscribe and get more content. Many “influencers” also sell online class subscriptions. All of this is fine and dandy and some “influencers” will be able to make some money, but here’s the catch – most won’t and most will waste way more money trying to be like the popular “influencers” than they will ever recoup in sales. This social media “being popular’ fixation feeds the worst parts of American culture. Several years ago, I started watching the “tiny house” shows on TV, which began a fad of many people opting for, as the sales pitch went… “living big in a tiny house”. The things glossed over were the problems insuring houses in America that don’t meet building requirements and the problems with building codes in many parts of America in regards to placing a non-permanent structure on residential property. Concurrent with the mindset of living with less stuff, expressed by many people opting for the tiny house living, are other fad lifestyles focused on “back to nature lifestyles”, living off-the-grid, preppers, and “homesteading”, a term that has taken on many meanings beyond what traditionally was considered setting up a homestead to operate a family farm. The things most of the YouTube people engaged in “homesteading” and living off-the-grid seem to have in common are most come from city or suburban lifestyles, most have no knowledge of farming, most mention learning about “homesteading” mostly from watching … you guessed it… YouTube videos by popular “influencers”. Don’t get me wrong, some of the “homesteaders” on YouTube appear to be working very hard to safely and responsibly build a working farm, that can provide most of their family’s needs. Separating the wheat from the chaff with homesteader channels can’t be determined by the number of YouTube subscribers a channel has. Being popular does not equate to offering good advice or knowing what you’re talking about. “Starting in the late 1960s, as many as a million young Americans — mostly white, college-educated and from middle-class backgrounds — left their homes in the suburbs and cities and moved, often sight unseen, to farmhouses, remote mountaintops and woodland clearings, with a goal of building their own shelter, growing their own food and living closer to the earth. A young Bernie Sanders was among them. Here’s the thing, it’s fine to try to set-up an online business using social media. It’s not fine to use your children as stage props, while they are living without even basic functioning water, sanitation, or heating systems in your hovel. It’s not fine to acquire livestock, you have no means to properly feed, shelter or pay vet bills. Large livestock are an expensive investment. It’s totally irresponsible to be unprepared for the cost of feeding and caring for them, but it’s beyond reckless to drag small children into a living situation, for which you have no training, no experience and no skills to provide even the basics of safe water, sanitation and heating… because you want to “live off-the-grid”. I watched videos of one such family seeking YouTube fame, where the father had a low-level retail job and talked about going to part-time hours, so he would have time to devote to promoting their new Patreon site and doing the YouTube videos… oh and I guess, in between all of their online time… work on the family “homestead”. Speaking as a mountain girl, who grew up around some of the most self-reliant, tough country folk, here’s the reality check for “homesteading” and “living off-the-grid” – the biggest part of being self-reliant is learning the basics of self-reliance in rural living before moving you and your family into a rural area you are unfamiliar with and unequipped with the skill sets to thrive in. Learn the basics before wandering off into the wilderness or countryside. If you don’t learn to properly plan, disasters and accidents will very likely befall you, your children, your livestock and your crops. Listening to advice from YouTube famous homesteaders bypasses the single most important thing that can mean the difference between survival and disaster in rural America – get to know your real neighbors and work hard to establish close community ties. In an emergency, sending text messages to people you know on social media is no substitute for calling someone in your neck of the woods for help. Your best resources for information on a rural area, which you are unfamiliar with, are the locals and many rural areas still have a county extension office, where you can get a great deal of agricultural and home food preservation information for free. The locals can direct you to the best places to get supplies, they can offer sound advice about the land and local climate, they can become your closest lifeline of support in an emergency. Relying on popular YouTubers advice isn’t a recipe for self-reliant living, it’s a recipe for calamity. We had some flower children set up communes on old farmsteads in the 70s, in our rural area. They had no clue how to live in the country, but at least they were living in a large group and many of them came from affluent family backgrounds, so they had the means to buy the necessities, because they sure weren’t going to survive on the fruits of their agricultural labors. This iteration of the back-to-nature movement, unfortunately, seems to be individual couples, many of them with young children being swayed by YouTube famous “homesteaders”.